The broad category of thyroiditis includes the following inflammatory diseases of the thyroid gland: (1) acute suppurative thyroiditis, which is due to bacterial infection; (2) subacute thyroiditis, which results from a viral infection of the gland; and (3) chronic thyroiditis, which is usually autoimmune in nature. In childhood, chronic thyroiditis is the most common of these 3 types. The second form of thyroiditis, Riedel struma, is rare in children. Secondary thyroiditis may be due to the administration of amiodarone to treat cardiac arrhythmias or the administration of interferon-alpha to treat viral diseases. Three multinuclear, giant cell granulomas observed in a fine-needle aspiration biopsy of the thyroid; from a patient with thyrotoxicosis from lymphocytic or subacute granulomatous thyroiditis. Radioactive iodine thyroid scanning is helpful in patients with hyperthyroidism who are thought to have subacute thyroiditis, because the extremely low uptake is consistent with the thyrocellular destruction in progress. Thyroid ultrasonography is useful in revealing abscess formation in patients with acute thyroiditis. 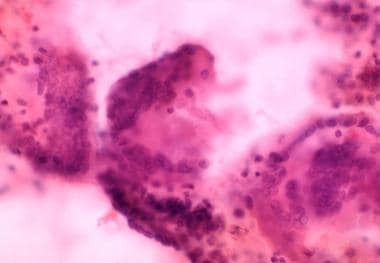 In patients with acute thyroiditis, fine-needle aspiration can be used to obtain material for culture, enabling appropriate antibiotic therapy. In acute thyroiditis, surgery may be necessary to drain the abscess and to correct the developmental abnormality responsible for the condition. Acute suppurative thyroiditis is rare in childhood because the thyroid is remarkably resistant to hematogenously spread infection. Most cases of acute thyroiditis involve the left lobe of the thyroid and are associated with a developmental abnormality of thyroid migration and the persistence of a pyriform sinus from the pharynx to the thyroid capsule. The usual organisms responsible include Staphylococcus aureus, Streptococcus hemolyticus, and pneumococcus. Other aerobic or anaerobic bacteria may also be involved. Subacute thyroiditis is generally thought to be due to viral processes and usually follows a prodromal viral illness. Various viral illnesses may precede the disease, including mumps, measles, influenza, infectious mononucleosis, adenoviral or Coxsackievirus infections, myocarditis, or the common cold. Other illnesses or situations associated with subacute thyroiditis include catscratch fever, sarcoidosis, Q fever, malaria, emotional crisis, or dental work. The disease is more common in individuals with human leukocyte antigen (HLA)–Bw35. Because chronic thyroiditis in children is usually due to an autoimmune process, it is HLA-associated, similar to other autoimmune endocrine diseases. The specific alleles in the atrophic and goitrous forms of the disease vary. The histologic disease picture varies, but lymphocytic thyroid infiltration is the hallmark of the disease and frequently obliterates much of the normal thyroid tissue. Follicular thyroid cells may be small or hyperplastic. The degree of fibrosis among patients also widely varies. Children usually have hyperplasia with minimal fibrosis. The blood contains autoantibodies to thyroid peroxidase and, frequently, autoantibodies to thyroglobulin. Autoimmune thyroiditis is also frequently part of the polyglandular autoimmune syndromes. Acute suppurative thyroiditis is rare in Western nations. Subacute thyroiditis is rare in childhood. The prevalence of chronic autoimmune thyroiditis varies depending on screening procedures. A Greek study showed a prevalence of thyroid antibodies as high as 12.5% in some areas. Few data are available regarding the incidence of the various forms of thyroiditis in the non-Western world. Acute thyroiditis is more common in geographic areas where antibiotic use is less prevalent. Long-term morbidity or mortality from thyroiditis is uncommon. Patients with autoimmune thyroiditis frequently develop hypothyroidism and require lifelong treatment. Patients with subacute thyroiditis may briefly have hyperthyroidism but usually regain normal thyroid function. Patients with acute thyroiditis generally maintain normal thyroid function. Recovery is usually complete, and thyroid function returns to normal. This self-limiting disease may last 2-7 months. Iacovelli P, Sinagra JL, Vidolin AP, et al. Relevance of thyroiditis and of other autoimmune diseases in children with vitiligo. Dermatology. 2005. 210(1):26-30. [Medline]. Bae JM, Lee JH, Yun JS, Han B, Han TY. Vitiligo and overt thyroid diseases: a nationwide population-based study in Korea. J Am Acad Dermatol. 2017 May. 76 (5):871-8. [Medline]. Vassilatou E, Papadavid E, Papastamatakis P, et al. No association of psoriasis with autoimmune thyroiditis. J Eur Acad Dermatol Venereol. 2016 Jun 21. [Medline]. Kiguradze T, Bruins FM, Guido N, et al. Evidence for the association of Hashimoto's thyroiditis with psoriasis: a cross-sectional retrospective study. Int J Dermatol. 2017 May. 56 (5):553-6. [Medline]. Ieni A, Vita R, Magliolo E, et al. One-third of an Archivial Series of Papillary Thyroid Cancer (Years 2007-2015) Has Coexistent Chronic Lymphocytic Thyroiditis, Which Is Associated with a More Favorable Tumor-Node-Metastasis Staging. Front Endocrinol (Lausanne). 2017. 8:337. [Medline]. [Full Text]. Pilli T, Toti P, Occhini R, et al. Chronic lymphocytic thyroiditis (CLT) has a positive prognostic value in papillary thyroid cancer (PTC) patients: the potential key role of Foxp3+ T lymphocytes. J Endocrinol Invest. 2017 Dec 11. [Medline]. Fisher DA, Greueters, A. Thyroid disorders in childhood and adolesence. Sperling MA. Pediatric Endocrinology,. 3rd ed. Philadelphia, PA: Sunders Elevier; 2008. 227-53. Demirbilek H, Kandemir N, Gonc EN, Ozon A, Alikasifoglu A, Yordam N. Hashimoto's thyroiditis in children and adolescents: a retrospective study on clinical, epidemiological and laboratory properties of the disease. J Pediatr Endocrinol Metab. 2007 Nov. 20(11):1199-205. [Medline]. Fava A, Oliverio R, Giuliano S, Parlato G, Michniewicz A, Indrieri A, et al. Clinical Evolution of Autoimmune Thyroiditis in Children and Adolescents. Thyroid. 2009 Feb 18. [Medline]. Sattar N, Lazare F, Kacer M, Aguayo-Figueroa L, Desikan V, Garcia M, et al. Celiac disease in children, adolescents, and young adults with autoimmune thyroid disease. J Pediatr. 2011 Feb. 158(2):272-5.e1. [Medline]. de Vries L, Bulvik S, Phillip M. Chronic autoimmune thyroiditis in children and adolescents: at presentation and during long-term follow-up. Arch Dis Child. 2009 Jan. 94(1):33-7. [Medline]. Dobert N, Balzer K, Diener J, Wegscheider K, Vaupel R, Grunwald F. Thyroid sonomorphology, thyroid peroxidase antibodies and thyroid function: new epidemiological data in unselected German employees. Nuklearmedizin. 2008. 47(5):194-9. [Medline]. Karges B, Muche R, Knerr I, et al. Levothyroxine in euthyroid autoimmune thyroiditis and type 1 diabetes: a randomized, controlled trial. J Clin Endocrinol Metab. 2007 May. 92(5):1647-52. [Medline]. Svensson J, Ericsson UB, Nilsson P, et al. Levothyroxine treatment reduces thyroid size in children and adolescents with chronic autoimmune thyroiditis. J Clin Endocrinol Metab. 2006 May. 91(5):1729-34. [Medline]. Mormile R. Celiac disease and Hashimoto's thyroiditis: a shared plot?. Int J Colorectal Dis. 2015 Aug 23. [Medline]. Tomer Y, Dolan LM, Kahaly G, Divers J, D'Agostino RB Jr, et al. Genome wide identification of new genes and pathways in patients with both autoimmune thyroiditis and type 1 diabetes. J Autoimmun. 2015 Jun. 60:32-9. [Medline].